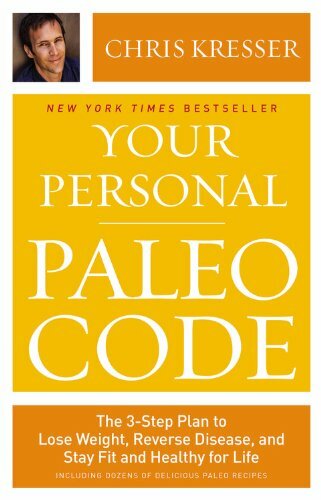 I just finished reading Chris Kresser’s book Your Personal Paleo Code. There is nothing new in this book if you are familiar with his blog or the basics of Paleo. It is a long winded version of Primal Blueprint mixed with Perfect Health Diet mixed with The Primal Connection. For the most part, the information seemed solid, but I would only recommend this book for someone new to the topic. At 416 pages I found this book could have easily been edited down to about half that size. Other that the length, I recall 5 issues I had with the book. There may have been more, but these stood out. Having read Kresser for years and listened to his podcast, I thought he had mostly rejected the low-carb interpretation of the Paleo diet. I thought he was leading voice for moderate intake of carbs. Yet, the recommendations for all but the most active seem low. He advises “most people” to get between 15-30% of their calories from carbs. Buried in a sidebar titled When To Think Twice About a Very Low-Carb Diet there is a mention of hypothyroid symptoms. I think this topic deserves more attention than it received. For years I’ve been reading how this problem is common in low-carb Paleo. I experienced it and I never went that low in carbs. What is the case for restricting carbs to these levels? It was never made in the book. Hasn’t this assumption that our ancestors were eating high fat diets been gradually eroding as we learn more? All I can think is that these are the macronutrient levels that have worked best for his client base. And if that is the case, I’m fine with that. Just be clear about it. For the record, I’m not anti-low carb. I’m just no longer convinced it is superior to moderate levels. Many of the arguments I’ve seen supporting LC have been discredited or weakened. If carb levels are optimal between 15-30%, make the case. Your Personal Paleo Code didn’t. No it is not. The fact there are carbohydrate sources with better nutrient profiles does not make sugar toxic. Chris likes and recommends ice cream, but says sugar is toxic. Well check your ingredient list there pal, ice cream has sugar in it. When I became underweight, I used sugar (in ice cream) to stimulate my appetite to regain weight. I also used a mix of refined white sugar and salt to lower my stress levels to get amazing sleep. Sugar is complicated at best. It is not toxic. The reason Paleo doesn’t like legumes is because they contain phytic acid. Phytic acid binds to minerals. The fear is that eating legumes will make one mineral deficient. Chris does get props for discussing how traditional cultures prepared their legumes via soaking, sprouting and fermenting. The question comes down to is if legumes without traditional preparation are worth eating. Chris says they are best avoided. I am more persuaded by the Precision Nutrition article Phytates and phytic acid. Here’s what you need to know. When phytic acid binds minerals in the gut, it prevents the formation of free radicals, thus making it an antioxidant. Not only that, but it seems to bind heavy metals (e.g., cadmium, lead) helping to prevent their accumulation in the body. To argue that some plant foods are “unhealthy” because of their phytic acid content seems mistaken, especially when phytic acid’s potential negative effects on mineral assimilation may be offset by its health benefits. I agree. There are many great Indian and Mexican dishes that uses legumes. I no longer buy the Paleo line on legumes, even if the beans are not traditionally prepared. Hell if time is the issue, then according to Food Renegade, a pressure cooker can reduce phytic acid levels significantly. I am anti-wheat. Me and Chris are in full agreement. However, unless one has a serious issue with gluten, I don’t think it is necessary to avoid all food with trace amounts of gluten. I also suspect that 100% avoidance could increase sensitivity. Chris was right when he said distilled liquors were safer because they are fermented. Well, beer is fermented too! Last year I got the idea that my body could handle beer from Chris’s podcast on the hygiene hypothesis. The short version is I used fermented foods to restore my gut flora that was destroyed by heavy antibiotics use. After listening to his show, I decided to test the health of my gut. So I drank a 4 oz beer and felt fine. Clearly a sign that I was healthier. I chose beer over bread, because it is fermented (partially digested). There is no mention of the hygiene hypothesis in the book. The point I want to share is that one can heal from gluten intolerance and that drinking a small amount of a tasty ale is not the same as eating a bowl of pasta. Exposing myself to trace levels of gluten via beer, soy sauce and gochujang has made me more resilient and thus more healthy. Chris repeats the myth that one needs high levels of protein to gain muscle mass. No you don’t. In fact, it is often counter productive. One needs an excess of calories to gain muscle. High levels of protein are satiating, which makes it difficult to eat a caloric surplus. I cover this in detail in the post Why Ice Cream is Better Than Protein Powder. Other than the 5 issues I laid out, this would be a fine book for someone new to Paleo. If you’ve already read those books, don’t waste your time with Your Personal Paleo Code. For those of us that have a background in Paleo, his podcast is much better than the book. It is more evolved. Next We Need a Browser Extension to Block Those Newsletter Pop-ups! One can argue that sugar is toxic. The poison is simply in the dose. So, practically speaking, you’re right. Technically speaking, he’s right. But also keep in mind that many of his clients are likely ingesting sugar at toxic levels (harmful over the long term). So, his message is appropriate for his audience, IMO. @Kevin – It is that simplistic false narrative that I have an issue with, which I why I used the term “complicated”. Paleo got popular as a response to the dogmatic – and false – narrative that saturated fat and cholesterol were toxic. You’d think the lesson would be to exhibit caution in throwing out these simple black and white views when it comes to food. I don’t see how it’s simplistic or false. Just because conventional wisdom got something wrong doesn’t mean Paleo (and Paleo aren’t the only people saying this) are wrong about the toxicity of sugar. That’s a logical fallacy. Are you suggesting that there is no degree of sugar that cannot damage the human body? Especially chronically high consumption over time? I agree with you making the argument that — practically speaking in the context of moderate sugar consumption — that sugar is not toxic. But that doesn’t mean that sugar isn’t toxic. @Kevin – Let me divide my response into 3 sections. 1- I believe Paleo is falling for the same mistake that Conventional Wisdom fell for. A simple narrative that turns out to be incomplete at best or false at worst. We traded one set of simple beliefs for another set of simple beliefs. Those beliefs in the end might be accurate, but I would have preferred a book with a little more humbleness and less certainty – like his podcast. 2- Sugar is fructose and glucose. Neither component is toxic. Our cells need them. 3- Excess sugar is not good for us, but that doesn’t make it toxic. It has more to do with the “excess” and less to do the sugar. Sugar rich foods are easy to eat in excess. And those extra calories over time can add up and cause health problems. For most people is probably still a wise idea to reduce sugar consumption, but mostly because it causes us to eat past satiety and that sugar can displace foods with greater nutrients. And I could be wrong. The point of this review was that YPPC didn’t make the case to me as a reader that is sugar is toxic. Great review! But since you weren’t that impressed by the book, which one (or more) would you recommend instead? I’ve lived in Japan for many years. The average height has increased noticeably in just two generations. I have observed the same thing in other countries, in other continents. In some cases, food shortages explain the problem (for instance, in post-war children). But in other cases, there has simply been a change of diet and that change has involved a higher amount of animal protein. I’m not saying that protein is THE answer to growth. But I cannot ignore the correlation. Calories alone do not explain the issue. Japanese have not been hungry for centuries. They have, however, been avoiding most animal sources until recently. @Joakim – I still think The Primal Blueprint is the best most concise explanation of the Paleo diet. Unlike his blog, the writing is tight. Just ignore the part about “insidious weight gain” on higher carb levels. @Txomin – I can’t speak to what that changed with child nutrition in Japanese history. My comment was specific to the “must eat more protein” advice given to adults for gaining muscle mass. I believe it is wrong and yet rarely challenged. My understanding of protein comes from Brad Pilon’s book How Much Protein?, Matt Stone and my own experience and observation. So many young male ectomorphs are choking down protein to get huge, yet they aren’t getting enough calories, because their appetite is suppressed from all that protein. Breast milk, which is highly anabolic, is just 6% protein. That’s not really an argument. Our cells need water, but water is toxic as well. Side note: Sucrose is fructose and glucose. But there are other forms of sugar as well. @Kevin – Water is not toxic. To be toxic means to be poisonous. The fact you can drink water until you die does not make water toxic. Once again, just like with sugar, it is the EXCESS. Here is a quote from Carbsane’s blog that I like. But here’s a thought — IF glucose were toxic to cells, why would the liver continue to produce glucose after a meal, and why would insulin stimulate uptake of glucose into the cells? Protein is comparatively more satiating (than fat or carbs) but, interestingly, it is not sufficiently satiating to prevent most people from overeating. Relative satiation is simply not enough. It is too easily bypassed. Again, it is difficult for me to ignore the correlation. Development is growth. I see it in the young, I see it on everyone. Perhaps the problem is that I am misunderstanding your position as an either or. It’s been known for decades that a calorie surplus is necessary to grow. But I don’t see how this implies that protein is a not necessary part of the equation. The fact is that protein consumption is being neglected due to food politics (e.g., cholesterol). And the fact too is that folks overeat plenty and over-ingest calories daily. Yet, even at the gym, the overeaters are fat not muscular. Plenty of calories, little protein. @Txomin – I did not say protein was not a necessary part of the equation. I said INCREASING protein is not necessary and might even be counter productive. My position is unless you are malnourished or a vegan, odds are you are consuming enough protein to build muscle. When I was eating high protein levels, I lost weight. Couldn’t gain muscle. When I lowered the protein, my appetite went up and ate more carbs. I gained muscle. Had I listened to Kresser or every other expert that blindly repeats “eat more protein” nonsense, I never would have gotten anywhere. If your goal is to lose weight, then absolutely increase protein. I had a post on that. Kevin, toxic is quite simply an inappropriate word to use for sugar (sucrose). Since there’s discussion on protein here and MAS linked to that post of mine where I made this point, protein is more toxic than sugar. “Rabbit starvation” is caused by the fact that humans can never meet their caloric needs through protein alone. At some point — depending on adaptation and genetics — your liver’s capacity to clear ammonia is exceeded and the protein WILL poison you. This threshold is somewhere in the 250-400 gram range. You’ll become nauseous and perhaps vomit if you eat more … if your body allowed you to keep eating protein you’d probably die. Nothing even remotely similar to this occurs when sugar is consumed. I’m sure there’s some dose of sugar that could kill you, just like water, but that is not the benchmark by which we determine toxicity. I posted the one I used, and sugar fits into that definition. I’m not sure how you could argue otherwise. I clearly see what you’re trying to say, but if you operate with the actual definition of “toxic,” I don’t think you can argue that sugar isn’t toxic. If the poison is truly in the dose, that doesn’t disqualify something from being toxic. If something is beneficial, that also doesn’t exclude it from being toxic. I understand that there’s a practical way of looking at this and a technical way of looking at it. I already pointed that out. Practically, I would agree with you for the most part. Technically, I disagree. Sugar fits the definition of toxic that I gave. So make up your own definition for a word and use it. The whole point about this is that toxic is not the correct term to use. It is hyperbole. It’s very difficult to take you seriously when you claim something I quoted is something I made up. https://en.wikipedia.org/wiki/Toxicity — Read the first sentence. That’s what I quoted. You keep saying your point, but it’s not an argument. You can’t say, “because I believe something, it’s true.” If you want to make an argument, you’re welcome to. But so far you haven’t done so, you just keep repeating your opinion. This is interesting, MAS. I expected you would like this book more than you did. When I read Kresser’s book (which, I agree, didn’t offer much in the way of new information), I understood him to be encouraging smart self-experimentation to discover what works best for each of us. I thought that would have been right in your “sweet spot”. To me, I saw his low carb recommendation as a default starting point (“…begin with a moderate carbohydrate Paleo diet” (p. 304) “some people on low-carbohydrate diets find more benefit from adding carbohydrates back into their diet than from further reducing them.” (p. 305)). Someone like you – lean with trouble maintaining weight on a low carb diet – is one of his candidates for higher carb intake (p. 304). I’d bet Kresser would say you did exactly the right thing by upping your carbs. Likewise for protein, for muscle building Kresser was advocating more than 10-20% of calories, but never more than 35% (pp. 308-309). For me, an active, middle aged, adult male, 30-35% of calories is roughly between 1 and 1.5 g, of protein per pound of body weight – a pretty standard recommendation for building muscle. Even that level was subject to individual experimentation (“eat as much protein as you crave”). What did you think about his views on caffeine? Wikipedia is often a good source but not here. I will amend my comment so rather than “make up” you have selectively chosen a made up definition. to determine the toxicity of arsenic. You will find similar definitions in other dictionaries. Toxic is a very specific term, and in the science it is characterized very specifically using measures such as an LD50. The glucotoxicity or lipotoxicity terms refer to the levels of those molecules in a particular cell (or organ in general) and they cause cell dysfunction and death. These are not related to dietary sugar or dietary fat. Sugar is not toxic. That is a matter of fact, not opinion. @Kevin – I just went back to the book. Seems Kresser is using your definition of toxic (dose based) and not the #1 definition in M-W. He later qualifies the word toxic to mean “in excess” and “in liquid form”. I don’t like the word or that the focus puts the blame on the food and not the “excess” part, but that is just my opinion as someone that has benefited from adding sugar to my diet (better sleep, better appetite). But after rereading his qualifiers, which seem fine, I’ll concede this point. There are others in the Paleo sphere that are using the M-W #`1 definition. @Geoff – I agree that Kresser has a balanced view on caffeine. It is a gray area “food”. Even though I run a coffee site, I can’t stand the health cheerleading articles because they don’t take in account we all respond differently. I’m sorry that you don’t know what the word “relative” means. That, I can’t help. I think we’re done, because I’m tired of being insulted. Like I said, I understand your point of view. Thanks for the convo. Kevin, cut the nonsense, I know perfectly well what relative means as I do dose. Sugar simply does not meet the scientific definition of toxic. Period. At the simplest level, a toxin is something capable of causing disease or damaging tissue when it enters the body. When most people hear the word toxin, they think of pesticides, heavy metals, and industrial pollutants. But even beneficial substances, like water, which is necessary to sustain life, are toxic at high doses. So Chris has redefined toxin as well, and since he mentions water he points out the reason not to misuse this term! Toxicity is a very specific term. Refined sugar is not toxic. Technically calling gluten toxic is misleading and incorrect as well. Just because a rare small percentage have a disease that makes their bodies react very badly, this does not justify the claim. Far more people find things like lactose, seafood, eggs, nuts, etc. “toxic” by that definition. Are bees toxic because some are so deathly allergic they might die from being stung? His case against industrial seed oil focuses on linoleic acid, but this is high in many nuts, and relatively high in olives and avocados. Perhaps it’s not the fatty acid that is “toxic”? Again, this much is quite a stretch based on copious literature looking at this, and hopelessly confounded against veggie oils by including margarines in the mix. Well Kevin you obviously have an active imagination. Who is this Evelyn aka CarbSane? What are her qualifications besides a one sided blog she operates? What is she an expert in? Has she written any scientific books of note? Does she have a PhD? Has she done any peer reviewed research herself? @Terry – CarbSane is one of the best researchers I’ve come across in since I started reading nutritional blogs in 2008. If she can look up a reference and point out an error, it doesn’t matter if she has a PhD or a GED. She is the one best researchers you’ve seen? Seriously, based on what? What is her research expertise? Nutrition? Copy and pasting? Linking? I agree that she need not have an advanced degree to have opinions, but to think her body of work (which is nothing) is equal to those she obsessively disparages at her blog is more than a stretch. 99% of what she does is tear down others who are far more qualified than herself. She has a pathological low carb phobia, and anyone–especially non experts– who have experienced success with that dietary protocol will be insulted, even vilified via her keyboard wrath. She’s condescending, uncivil, patronizing, cruel, pompous, arrogant, and shrill. She also has this special dislike for Gary Taubes, which is simply preposterous. To be kind it’s obsessive. Period. I like your blog, but why you elevate her to such a lofted status is beyond me. Do you approve of her caustic, insulting nature, which is easy to document vis a vis Google? She goes out of her way to hurt people. Only sadistic people do that to others. Perhaps you agree with her that low carbers are nuts, and likewise those experts who advocate LCHF, etc, according to her, are disingenuous snake oilers. There are better so called researchers than this wrathful, angry person to hang your hat on, however. @Terry – We all have different styles. I get that people don’t like her tone. But ** for me **, I’m more interested in discovering the truth. Believe it or not, I don’t think she is anti-low carb. She is against those in the LC community that make scientific claims that they either can’t backup or are false. Her style gets attention. It got my attention. In the age where most bloggers seem to be cookie-cutter, super nice, straight out of seminar on how to make money blogging, it is refreshing there are authentic people creating content. Even if you don’t like them. It is real and I like that. A lot of people hate Richard Nikoley. I don’t. I love how he doesn’t care if you agree with him or like him. You can’t fake that. I was an early fan of Taubes. I read GCBC in its entirety 3 times. I’ve met him personally and heard him speak. A lot of people in the LC/Paleo community were raving about Taubes back then. But there was one researcher that figured out that not only was Taubes wrong about his insulin hypothesis, but he likely knew he was wrong prior to publication. That researcher was CarbSane. I wanted Taubes to be right and her to be wrong. But the deeper I dove into the topic, the more I realized his this insulin theory was wrong. Since then many others have come to the same conclusion. I’m not alone. I still think Taubes is right about a lot of things (salt, lipid hypothesis, and mostly right about exercise and appetite). I’m not hanging my hat on her. Seeing her expose so many fake nutritional gurus has taught me not to hang my hat with anyone. Taubes could be wrong about his insulin hypothesis (I don’t agree with you that he is) without it being a nefarious act on his part. Unless you or Carbsane have evidence that Taubes knew his hypothesis wasn’t correct before publication then it would be prudent to not go there absent proof of his motives. As for these so called cookie cutter paleo/LC folks, etc, who are pushing snake oil lies, you could at least name names. Otherwise you’re broad brushing everyone advocating for low carbing, which is a scurrilous Carbsane tactic. I know you’re better than that. Carbsane has went after and character assassinated Peter Attia, Taubes, Petro Dobromylskyj, Thomas Dayspring, Michael Eades, Mark Sisson, It’s the Woo , Jeff Volek, Eric Westman, Steve Phinney, etc, among many others. She claims they are preaching an all or nothing, everyone must partake of to be healthy nutritional gospel, which is patently false–read: she’s lying. I don’t know about you, but that’s not the behavior of a decent or honest person. That’s simply slanderous and libelous behavior. It’s not research or science. Not even close. @Terry – I have no interest in rehashing the old Taubes vs Carbsane timeline. It is old news to me. If you are interested you can review her site, but you probably won’t. It isn’t my battle. I’ve covered this before, but it was the G3P argument in GCBC that sold me that turned out to be false. Taubes has admitted he was wrong. Bailor tried to peddle this nonsense as late as last year. By ‘cookie cutter”, I was referring to bloggers in general, not those specific to the LC/Paleo community. You see them in every topic. I don’t see what you see. I see arrogant LC/Paleo “gurus” that when confronted to backup their claims get dismissive or defensive. Instead of addressing the counter evidence, they attack the motives or they just ignore the attack. They are more interested in protecting their pocketbook than advancing nutritional science. I could be wrong. Maybe you are right. I don’t know. That is all I have to say on the topic. MAS, you seem like you’re pretty good at taking a step back and evaluating your positions without getting too emotionally involved. Is that something you’ve worked on, a blog-based thing or just something you’re good at? I’ve certainly gotten better at it and funnily enough diet was one of things that helped me move forward. I went hook line and sinker for the carb-insulin hypothesis and really stuck to my guns well past the time it made any real sense to do so. That taught me to be careful about getting invested emotionally in things like that, but to be honest I haven’t gotten better at avoiding the emotional attachment, just at recognizing it and walking back from the ledge. I wonder if you have any tips or thoughts. There’s a pretty fine line between deciding something is true, especially if you have to act upon it publicly or even privately, and becoming irrationally committed to it. Terry, you’ve thrown some pretty hefty accusations at me without providing any specific examples. I also don’t think you know the definitions of various terms you are using such as “character assassination”. Please show me where I have engaged in that regarding anyone on that list of yours. Note: Pointing out flaws and inconsistencies in public statements that reflect poorly on an individual, or pointing out financial interests is NOT character assassination. Inferring that I am dishonest — with zero evidence — now that is. Do I know you? Have we ever exchanged comments on my blog, perhaps under another name? It doesn’t get much worse that using figures from a textbook repeatedly in lectures when that text book directly contradicts what you put forth in your book. I would suggest that you refrain from trashing me on other people’s blogs until you have actually read what I write and link to specifics so that I can defend myself, should I choose, against your derogatory statements. @Karl – Thanks. I think it was investing that made me approach nutrition the way I have. I’ve both made and lost a lot of money. Being wrong and being able to move on is part of investing. I did do a post that merges investing concepts with nutrition. The section on stop-loss might be helpful. Since you mentioned Richard Nikoley, I’ll mention this: I think one huge problem with people who are against LC protocols is that they never define it, probably because it’s undefinable. LC is relative. Should a keyboard warrior eat 400g of carbs a day, even if those carbs are from whole food sources? If you’re metabolically deranged and mostly sedentary, what’s the physiological need for a high carb diet? And what defines high carb? Eating whole foods and shunning processed foods almost certainly puts you on an LC diet compared to the SAD, does it not? Even if you’re eating fruit and starches. It’s much tougher to get 80g of sugar from fruit than it is to slurp down a Chick-fil-A milkshake. It takes a lot of potatoes and rice to equal what people are putting in their body in the first fifteen minutes of a movie at AMC. Furthermore, what if one acknowledges that LC is therapeutic for some and a whole foods HC diet is beneficial for others? Are they half wrong? Half stupid? Seems people like Richard trends toward that. It’s almost to the point where the dogma spouted by HC (however that’s defined) is similar to that spouted by LC (however that’s defined). Maybe, possibly, both camps are right depending on the individual they’re talking about? This isn’t an LC vs HC battle. It is the advice being peddled by many in the LC Paleo community that ketosis and VLC is a natural lifestyle diet that I disagree with. Not because I am smarter than them, but because I don’t think that level of restriction is necessary. I don’t eat low carb and I don’t drink Chick-fil-A milkshakes. I do eat potatoes, white rice and corn in the form of tortillas and hominy. I don’t eat bread, but once in a while I’ll have a GF treat. And yes I do eat ice cream, but not everyday. My carb levels cycle. I don’t count anything. And I don’t tell others how many carbs they should eat. But I will question those in the LC community that preach intolerance for carbs. Note that there a huge difference between me questioning Kresser’s 15-30% carb ratio than me saying he is wrong and it should be higher. I am saying he failed to make the case in the book. That doesn’t mean I think he is wrong. I’m just skeptical. If I had to guess what the ideal carb ratio is today it would be ~40%. Maybe 50% if I were more active. But that is guess. A hedge based off what I know and what I’ve experienced. And that number is for me today. If could be different for others and my opinion could change.